Instructions in this section apply to Staff List Pro plugin. You can follow them for our other plugins with the plugin name being the main difference. Go to Plugins > Add New > Upload Plugin. Browse for the zip file that you have downloaded. Staff List Search, Staff List Table and Staff List CSV are plugin extensions. They require Staff List Pro plugin to be installed. Go to Plugins > Installed Plugins > Staff List. Deactivate free plugin Staff List. Click Add New > Upload Plugin. Browse for a file Staff List Pro. Delete the free version of Staff List. Install plugin from Network Admin Dashboard as usual for a multisite. Do not Network Activate the plugin. Go to Dashboard of individual sites and enable the plugin there. 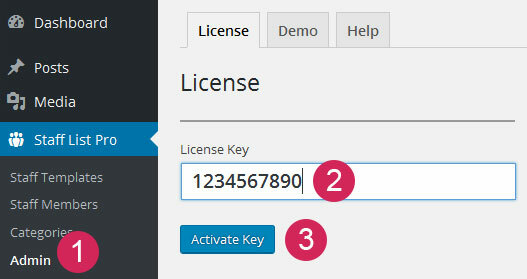 To receive automatic updates of our premium plugins you must activate your license key. Once the license key is active you will be able to update the plugins via your WordPress Administration Screen: Dashboard > Updates or Plugins. Automatic Update is Unavailable for this Plugin. Automated updates require a license key. Even when you enter and save a valid key, it may take WordPress up to 24 hours to contact our licensing server. You can choose to wait or use Check for updates option to instantaneously validate your license. Updating Staff List Plugins on a Multisite. Deleting the plugin won’t delete the plugin data! Delete Staff List shortcode from all pages. Deleting Staff List CSV will also delete field mappings. To reinstall the plugin and keep all the options intact you need to update the plugin manually via FTP. The plugin settings are not affected by automatic updates.